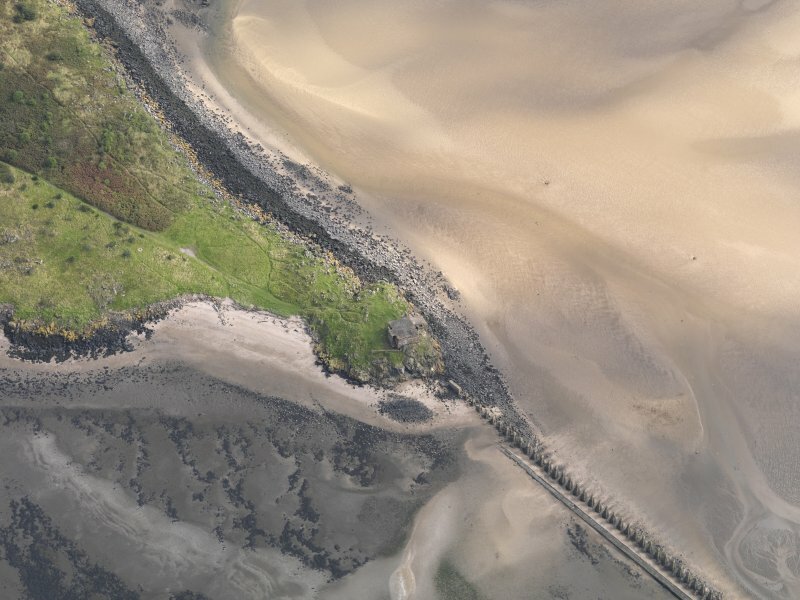 Oblique aerial view of Cramond Island centred on The Knoll, taken from the SW.
Edinburgh, Cramond Island, The Knoll battery and anti-shipping barrier. Scanned image of general view of battery and N end terminal of anti-shippuing barrier from South East. 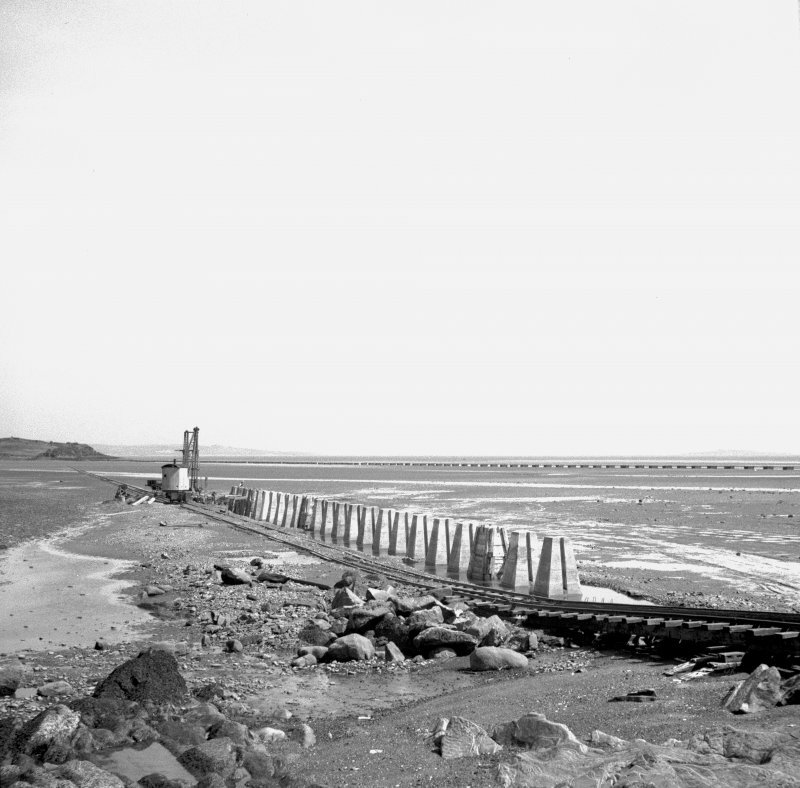 Scanned image of view NW of the anti-shipping barrier running from Cramond to Cramond Island, showing the partially completed S end of the barrier. A pile driving rig is visible at the N end of the newly constructed section. Construction has reached approximately half way across the channel. 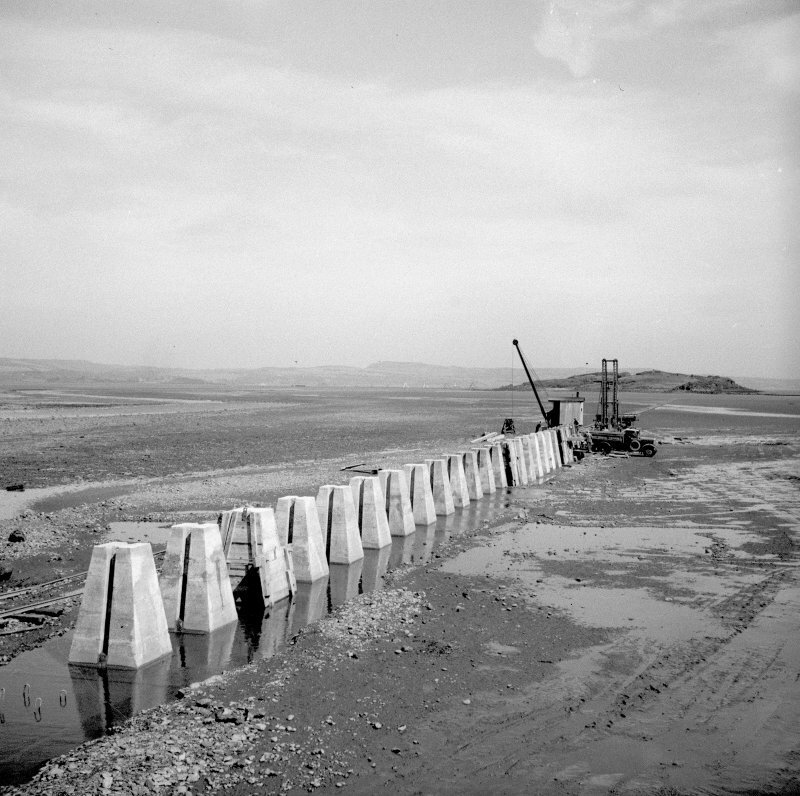 Scanned image of view N showing construction work on the S part of the anti-shipping barrier between Cramond and Cramond Island. 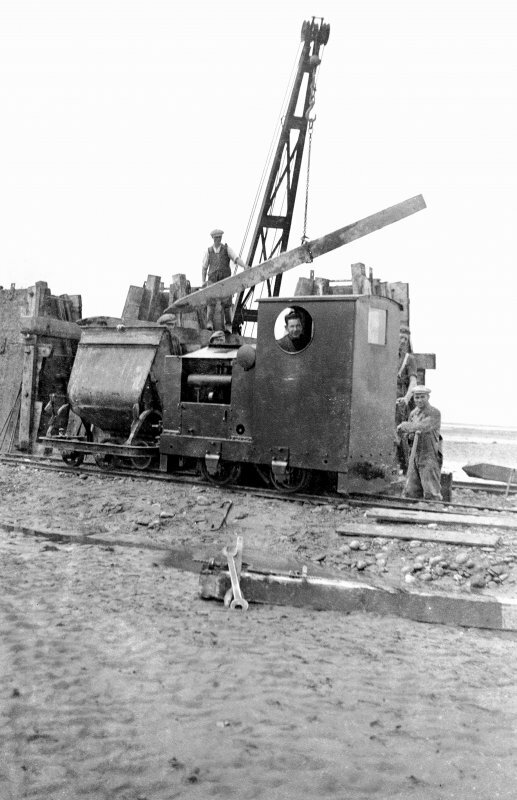 The photograph shows the founds with steel formers protruding and in the background a steam crane running on broad guage track along with the pile driving rig. Scanned image of view NW of a pile driving rig used in the construction of the anti-shipping barrier between Cramond and Cramond Island. 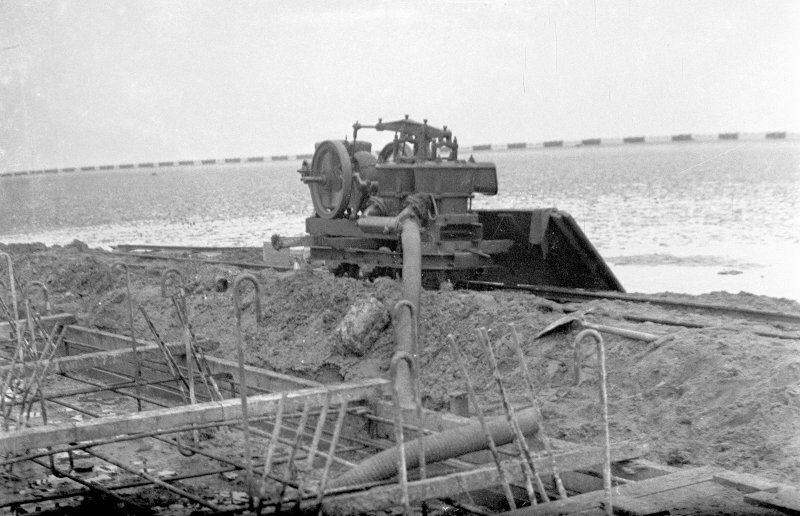 The photograph shows the rig running on broad guage track laid on the sand at low tide. The hammer is driving concrete piles ahead of the construction of the barrier. Cramond Island is visible in the background. Edinburgh, Cramond Island, anti-shipping barrier. 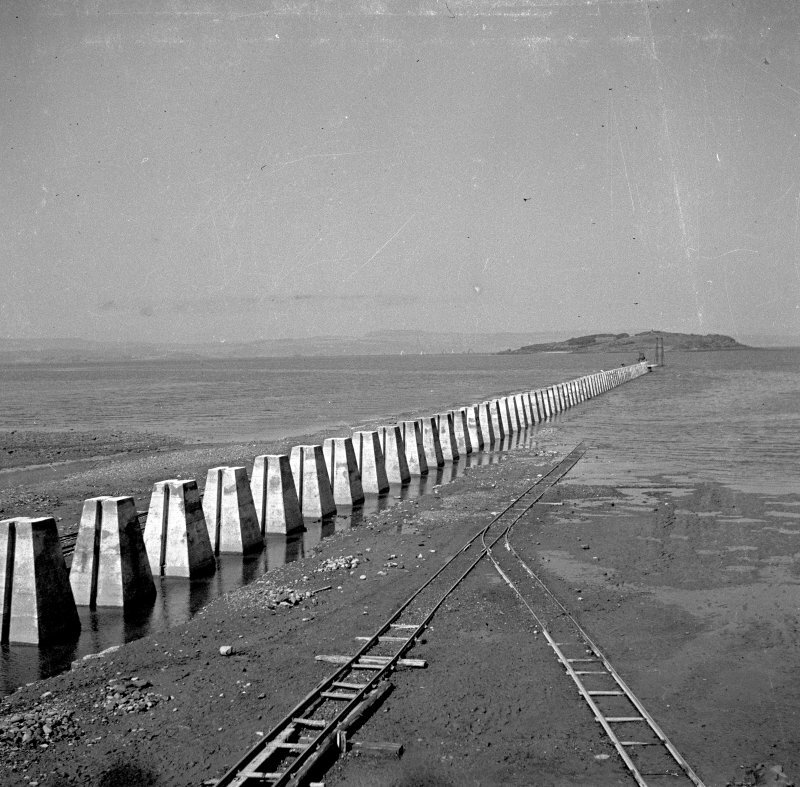 View of barrier from North. 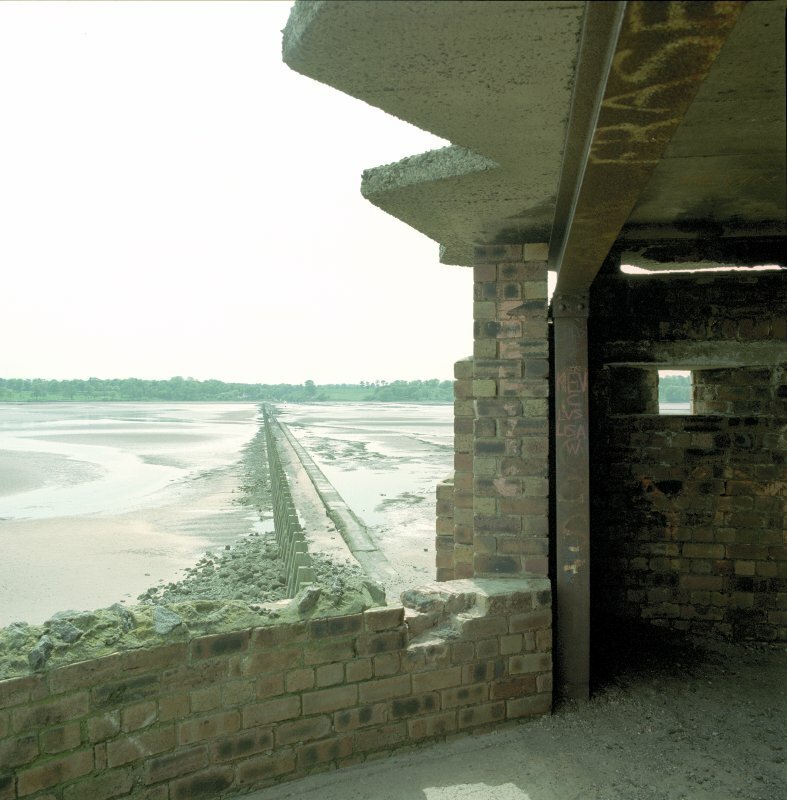 Edinburgh, Cramond Island, The Knoll battery and terminal of anti-shipping barrier. View of battery gun emplacement, observation platform and shipping barrier terminal from South West. 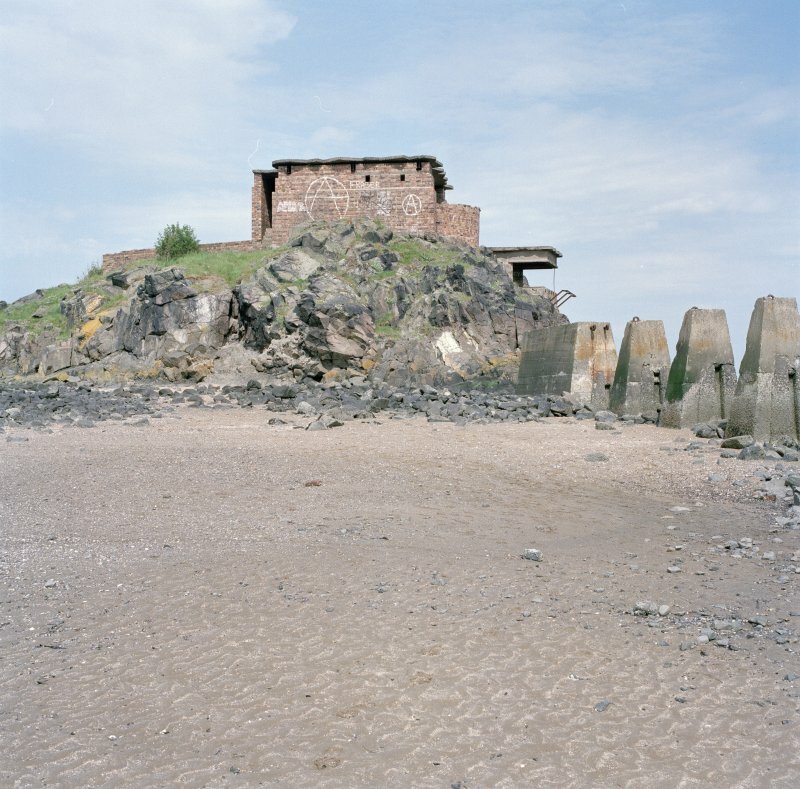 Edinburgh, Cramond Island, The Knoll battery and anti-shipping barrier. 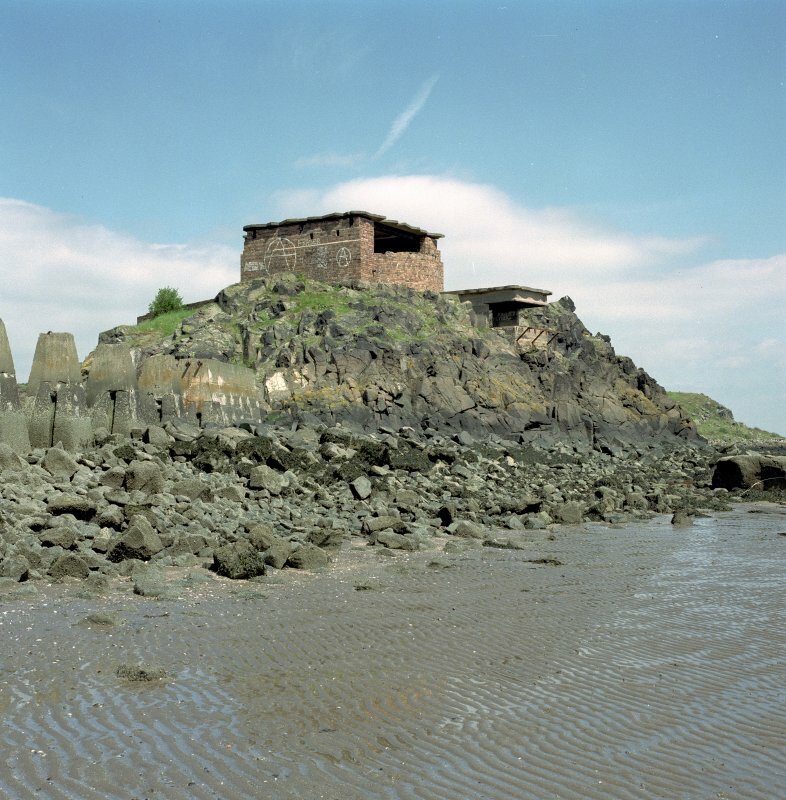 Scanned image of view of anti-shipping barrier from the North end showing part of The Knoll battery constructed to defend the tidal area between Cramond and the Island. 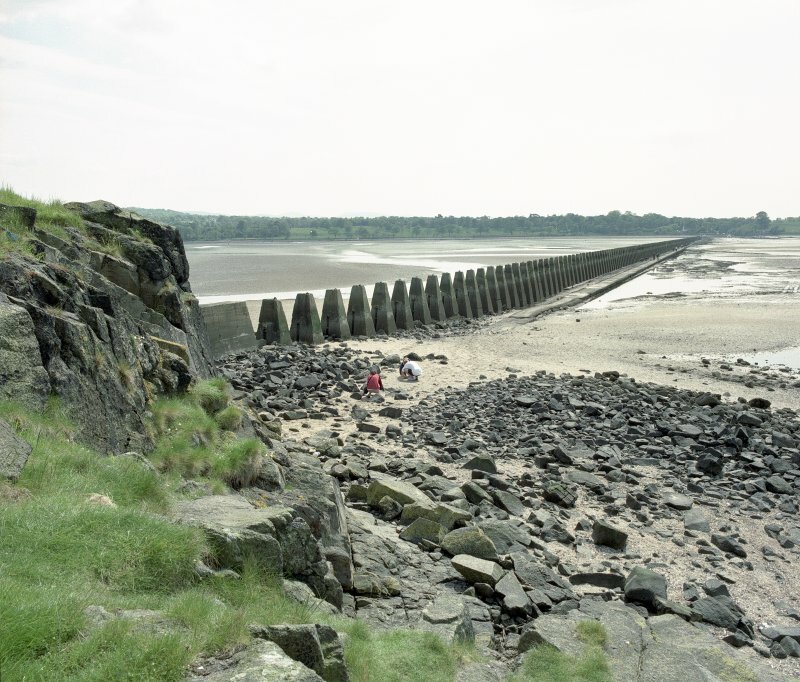 Scanned image of view NW of the anti-shipping barrier running from Cramond to Cramond Island, showing the partially completed S end of the barrier. A steam crane and pile driving rig are visible at the N end of the newly constructed section. One pillar still has the shuttering in situ. 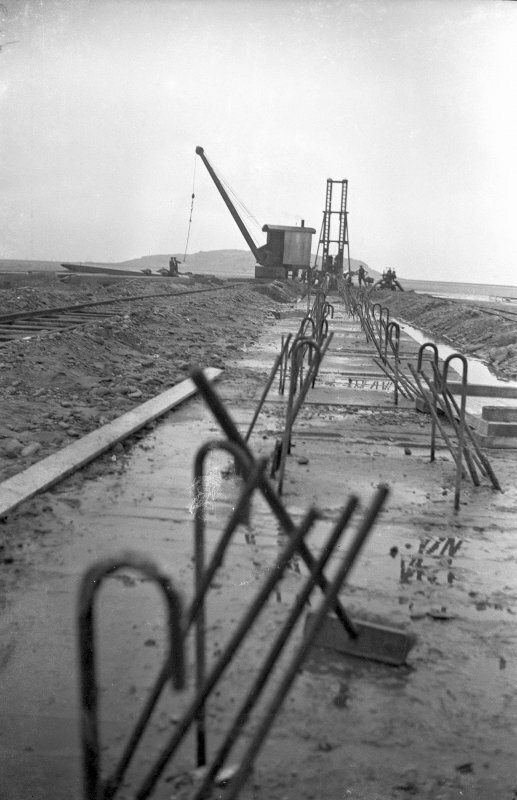 Scanned image of view NE showing construction work on the S part of the anti-shipping barrier between Cramond and Cramond Island. 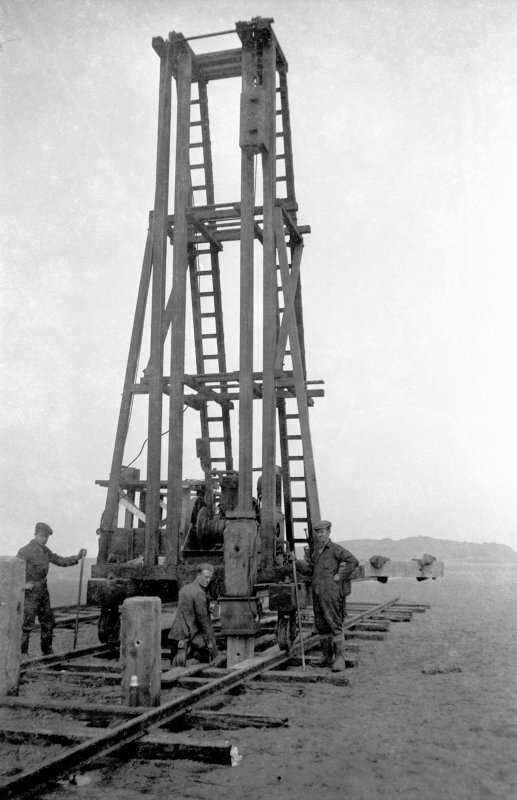 The photograph shows the completed pillars and in the background a steam crane running on broad guage track next to a pile driving rig. In the background, further to the E and running across the channel, is an ealier temporary barrier. 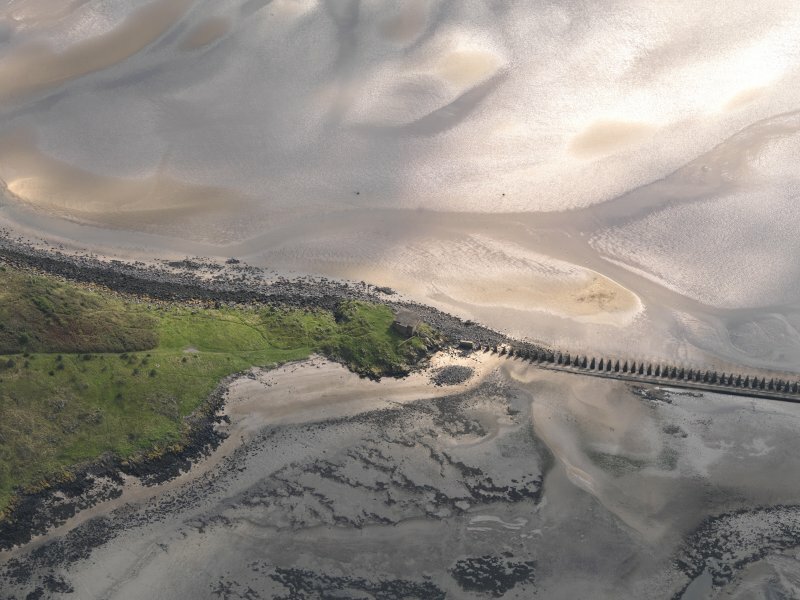 Oblique aerial view of Cramond Island centred on The Knoll, taken from the W.
Scanned image of view NE of a Ruston & Hornsby narrow guage diesel locomotive used in the construction of the anti-shipping barrier between Cramond and Cramond Island. The locomotive is situated on the S end of the partly constructed barrier.